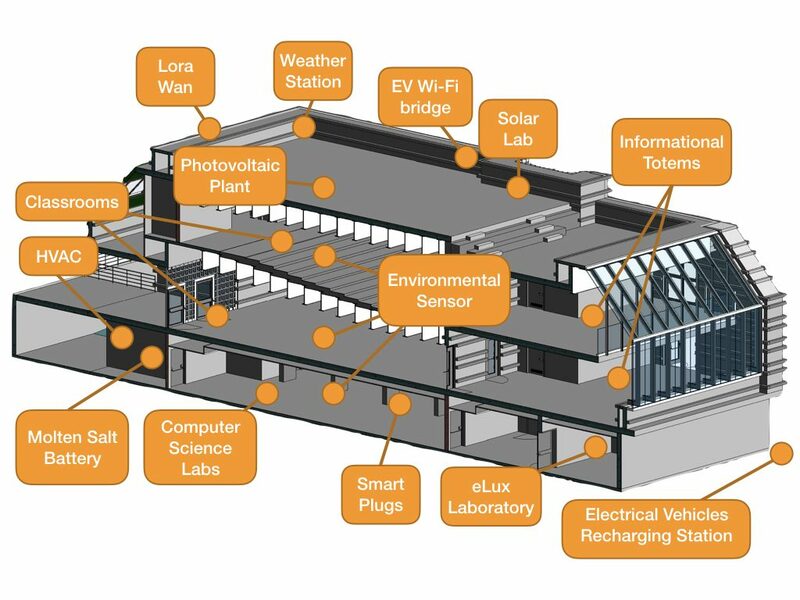 The eLUX living laboratory is located into the engineering department area of the University of Brescia, Italy, Via Branze 38, and it is part of a bigger initiative to transform the current campus into a smart one. Up to now, main facilities are located in two main zones as highlighted in the figures below. 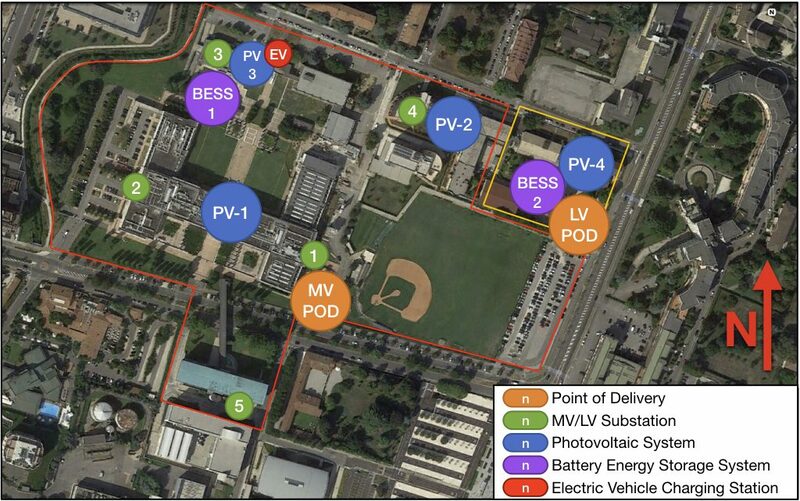 All the buildings and facilities located in the red area of the Campus are fed by a private medium voltage (MV) electrical network, which is connected to the main grid by means of a MV Point of Delivery (POD). The electrical network is formed by five MV/LV (Medium to Low Voltage) substations, connected to the MV POD through a radial topology. Conversely, the students residence, called “residenze Emiliani” and located in the yellow area, is connected to a low voltage (LV) POD. The heart of eLUX is located in a building called “Modulo Didattico”, fed by the MV/ML substation n3. A single-mode fiber optic network (star topology) is dedicated to the automation of 6 medium voltage cabins and part of low voltage sections. The building (rounded in red on the left of the picture) hosts 3 classrooms and 2 Computer Science laboratories. “Outdoor Testing Station (OTS)”: system for verification and characterization of the energy performance of building products such as walls, windows, etc. (up to a maximum of 3 artifacts at the same time) under real operating conditions, ie in an external environment. The building (rounded in red on the right in the picture) host the CEDISU residence, the cafeteria and a bar. In the area are present also study halls, a gym, a polyfunctional room and computer halls for the residents.